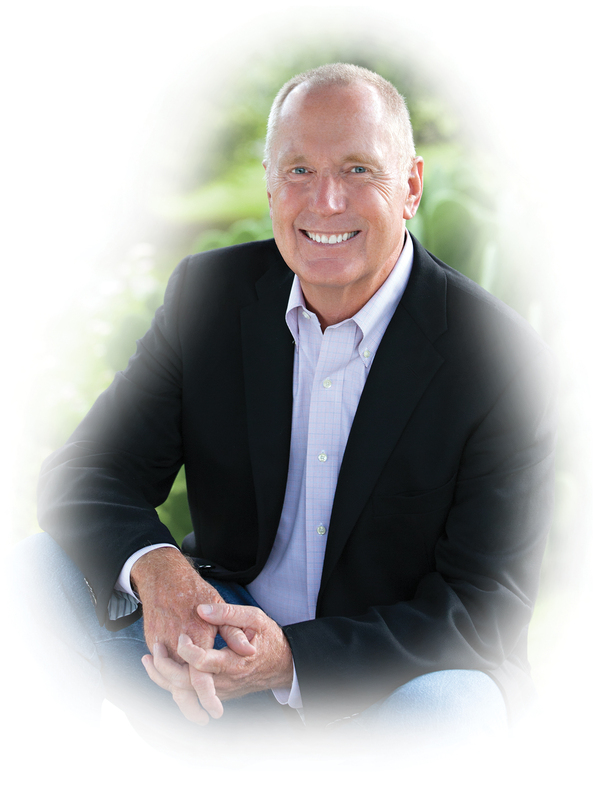 The Max Lucado Papers are ready for researchers. 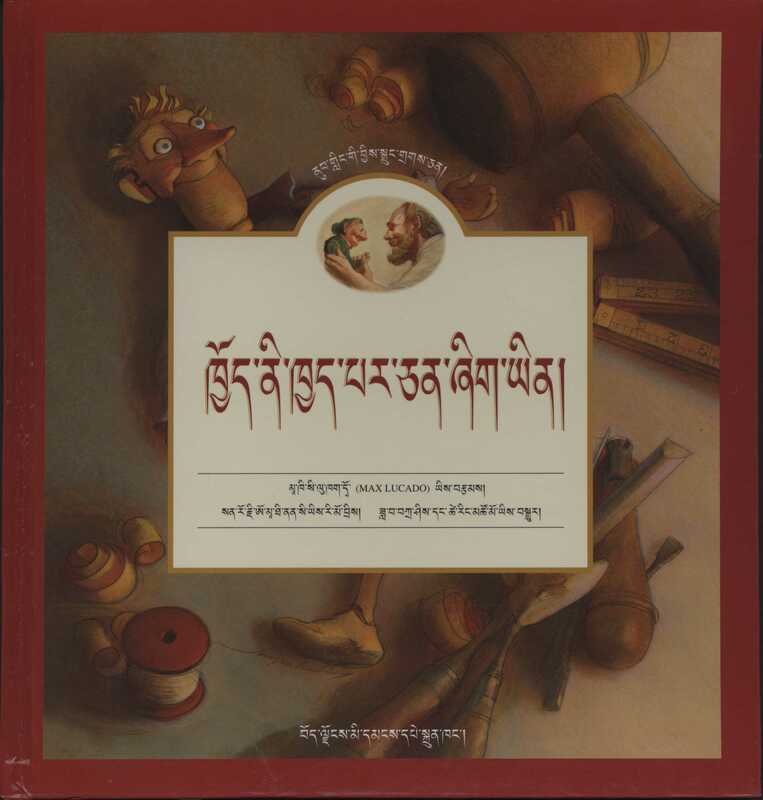 A finding aid is available on DigitalCommons@ACU and digital exhibits celebrating various aspects of the collection are available on the Exhibits page of our blog. Correspondence from Tyndale House. Box 1 of 153, Series I. A Box 1 of 1, Max Lucado Papers, 1965-2016. Center for Restoration Studies MS #316. Milliken Special Collections, Brown Library. Abilene Christian University, Abilene, TX. 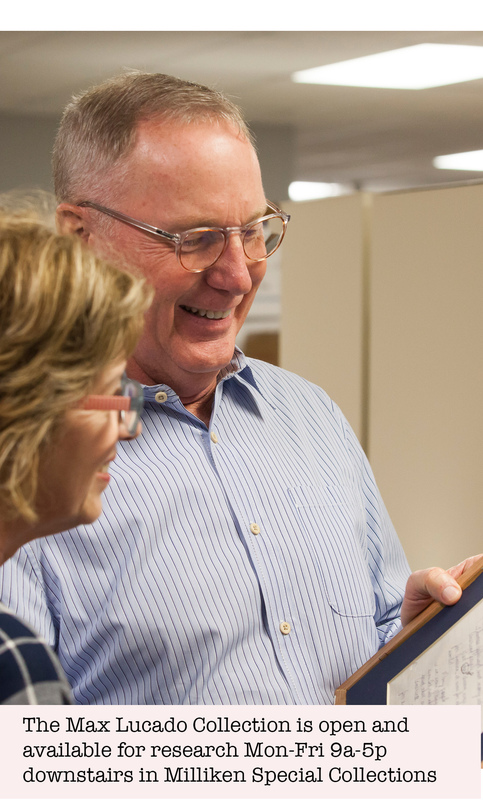 The Max Lucado Papers were established in 2015 when Lucado designated his alma mater’s Brown Library as the repository for materials documenting his career as a missionary, evangelist and writer. Lucado was the university’s Oustanding Alumnus of the Year in 2003 and earned bachelor’s (1977) and master’s (1982) degrees from ACU. 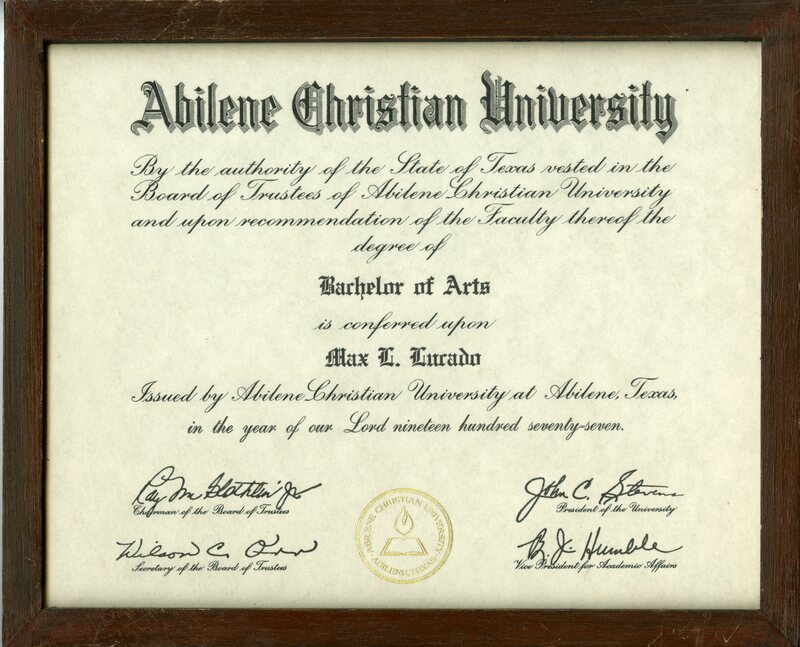 Max Lucado’s diploma. Box 106 of 153, Series III. A Box 13 of 14, Max Lucado Papers, 1965-2016. Center for Restoration Studies MS #316. Milliken Special Collections, Brown Library. Abilene Christian University, Abilene, TX. 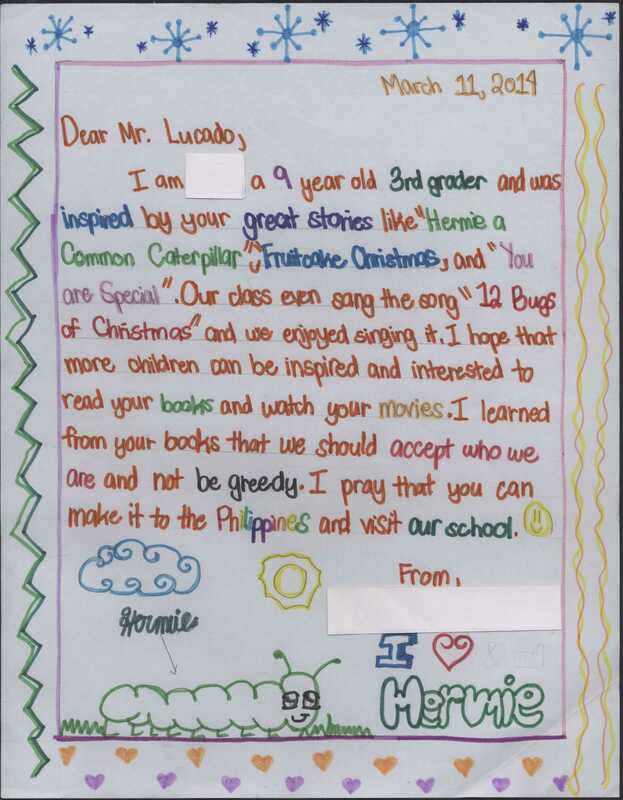 Letter from child, 11 March 2014. Box 121 of 153, Series III. B Box 15 of 15, Max Lucado Papers, 1965-2016. Center for Restoration Studies MS #316. Milliken Special Collections, Brown Library. Abilene Christian University, Abilene, TX. 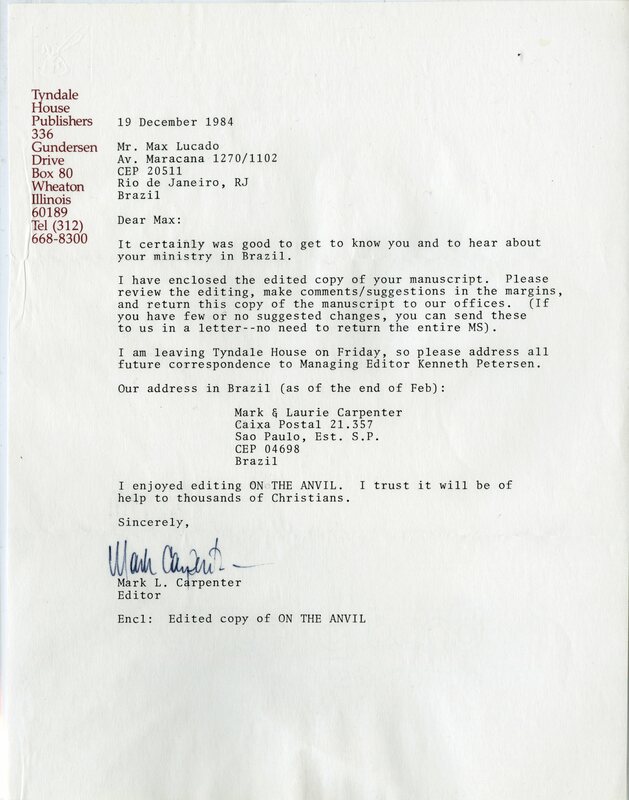 The Max Lucado Papers contain 153 boxes of materials created or collected by Max Lucado. The four series in these papers house Lucado’s productions (sermons, books, media), correspondence, awards and memorabilia, and merchandise. Lucado, Max, and Sergio Martinez. 2009. [You are special]. In conjunction with our current exhibit, “The book will be preaching after you and I have gone home”: Marshall Keeble’s Print Legacy we’ll be featuring blog posts contributed by our student workers to provide expanded content on the “Fellow Workers” pictured in Biography and Sermons of Marshall Keeble, Evangelist. Today’s post was written by Jeaniece Silas and Sarah Dillinger. Jeaniece Silas is a Senior Social Work major and child and family services minor from Fort Worth, Texas. She has been a student worker in Special Collections for three years. Jeaniece enjoys processing collections and finding out historical information while working in Special Collections and hopes to pursue a career in Social work when she graduates. Sarah is a Senior Social Studies major from Pittsburgh, Pennsylvania. She has been a student worker in Special Collections for three years. Sarah enjoys the research and connections she makes while working in Special Collections and hopes to pursue a career in history teaching when she graduates. 1931 photographs of men Marshall Keeble either baptized or encouraged to preach. B. C. Goodpasture, ed., “Biography and Sermons of Marshall Keeble, Evangelist” (Nashville: Gospel Advocate Company, 1931), 24-25. After extensive research, neither of us could find any information on Thomas Dickson and James F. Hewin who are two of the six men pictured in Marshall Keeble’s biography as men Marshall Keeble influenced. Hopefully, in the near future, new information regarding these two men will appear so that researchers can continue looking at the impact Marshall Keeble had on the Church of Christ movement within the African American community. In conjunction with our current exhibit, “The book will be preaching after you and I have gone home”: Marshall Keeble’s Print Legacy we’ll be featuring blog posts contributed by our student workers to provide expanded content on the “Fellow Workers” pictured in Biography and Sermons of Marshall Keeble, Evangelist. Today’s post on John Vaughner was researched and written by Sandrine Ingabire. Sandrine is a Senior Global Studies major from Kigali, Rwanda. She has been working in Special Collections for over a semester now. She is interested in international development focused on small businesses and empowering low income people through providing them with opportunities to make an income. She loves writing and hopes the skills she gains while working in Special Collections will transfer to her career in the future. John Roy Vaughner was born on December 20, 1894 in Fairfield, Alabama where his home congregation was also located. In March 1916 he married Madie Roberts Vaughner. He was baptized by Marshall Keeble on December 20, 1925 in St. Petersburg, Florida. Keeble considered Vaughner to be a spiritual son. Shortly after his baptism, He began preaching in Birmingham, Alabama. 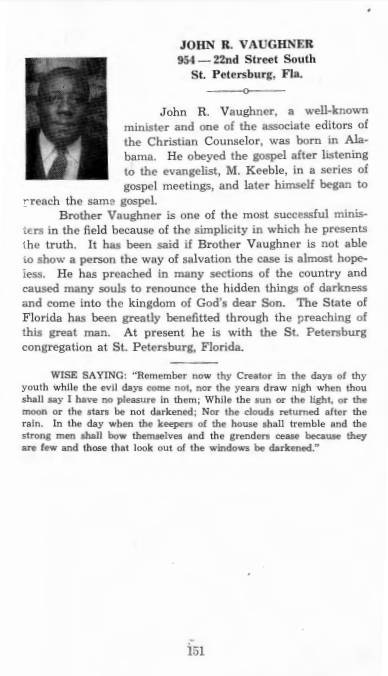 Other churches he served include congregations in Henderson, Tennessee (1927), St. Petersburg, Florida (1930-42), Tampa, Florida (1943), and Bradenton, Florida (1935). 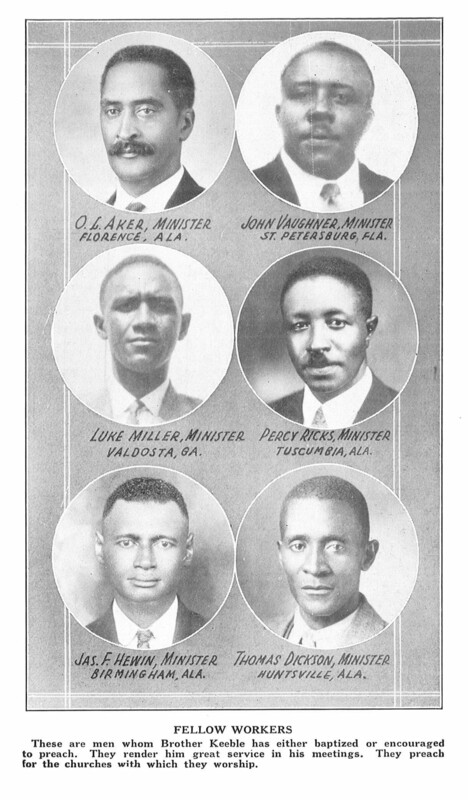 Tuggle, Annie C., “Our Ministers and Song Leaders of the Church of Christ” (1945). Stone-Campbell Books, page 151. Vaughner was known as a meek and humble person as a result of Keeble’s mentorship. These characteristics led him to winning many white people’s favor who eventually gave him generous financial support for his work. Due to this support, he was able to plant another church in Alachua, Florida. He was also able to stabilize congregations in Tennessee, West Virginia and Florida. In 1947, he baptized an entire black Baptist church along with its minister Mr. Cook. In 1959, Vaughner moved to Petersburg, Florida where he stayed for a while. He is known for having done much evangelistic work in Florida. He was able to establish thirty-eight churches in Florida. His evangelism influenced and transformed many and by 1959, he had baptized hundreds of people in his congregations. Some of the preachers he baptized include Charles James Anderson, Raymond Jones Dunwood, I. Gleaton, Columbus Grimsley, and Archie Smith. He also instructed and baptized Fleming Livingstone, who later became one of the most influential preachers of that era. Vaughner served in World War I as a Corporal in the 92nd Division from December 6, 1917 to March 18, 1918. He died on June 18, 1960 at the age of 65 in St. Petersburg, Florida. He will forever be remembered for his work as a preacher and evangelist and for the lives that he transformed. Find A Grave, database and images (https://www.findagrave.com : accessed 16 September 2018), memorial page for John Roy Vaughner (20 Dec 1894–18 Jun 1960), Find A Grave Memorial no. 121987666, citing Memorial Park Cemetery, Saint Petersburg, Pinellas County, Florida, USA ; Maintained by Tom Childers (contributor 46515204) . Robinson, Edward J., “Sons of Marshall Keeble: Luke Miller, John Vaughner, and James Cothron” (2005). Lectureship and Summit Audio Collection. 1574.